What do you do after a couple of weeks like I’ve had lately? You head for the beach–that’s what!! You don’t even go shopping. 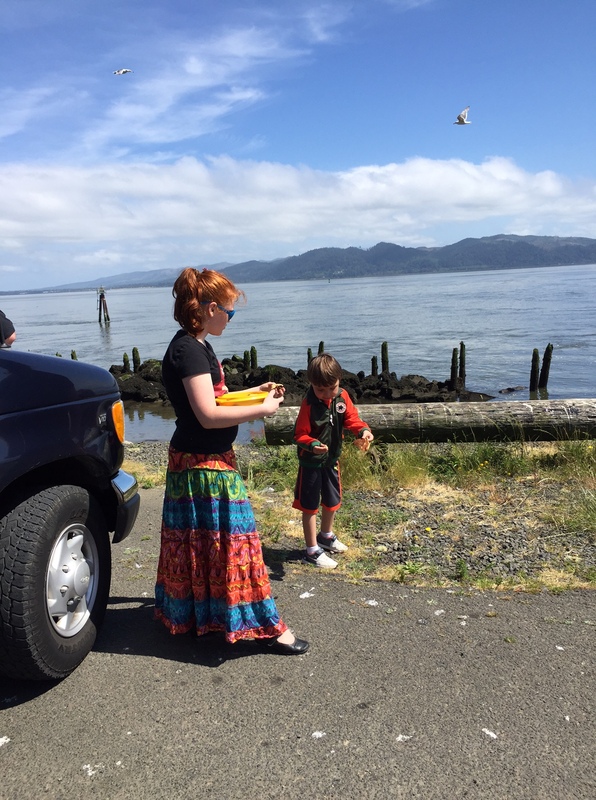 You just throw a bunch of food that you have on hand into the camper, along with some clothes, and you drive away–right out of the heat wave and into the cool, marine air. 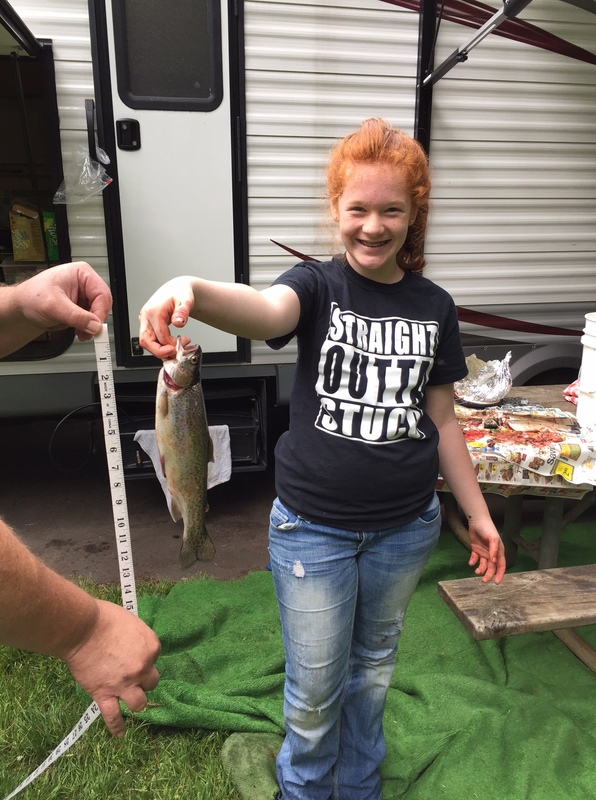 You go fishing in a lake that is in the campground. You catch 0 fish. Patsy and Rob do quite well. You go crabbing off a bridge for hours and hours. 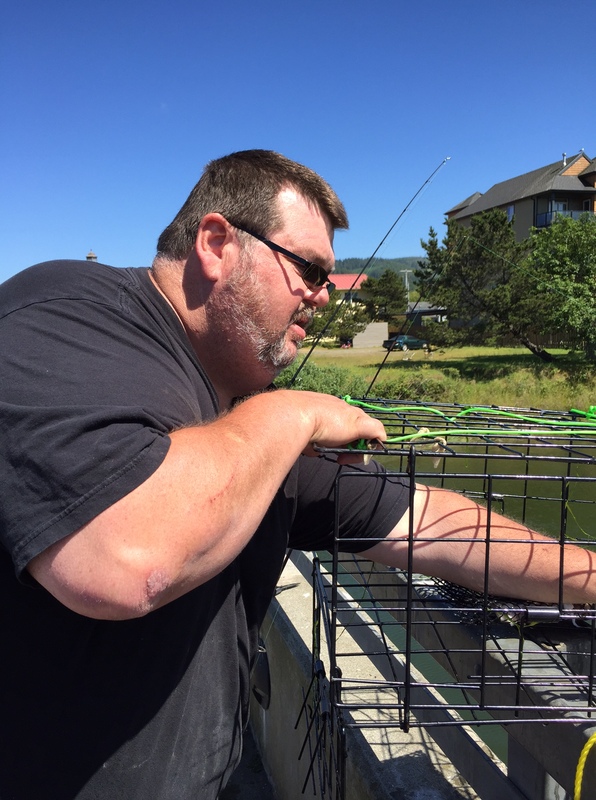 Thanks to a kind man who drove by, and offered old clams and clam guts from his freezer that he was cleaning, and a little luck, you catch 2 keepers (males over a certain length) when most others on the bridge are not getting any. “Not long, if Uncle has anything to do with it!” The little bass was not big enough to keep, but it was super fun for Jake to catch. Then he was done. He went to draw with Patsy. 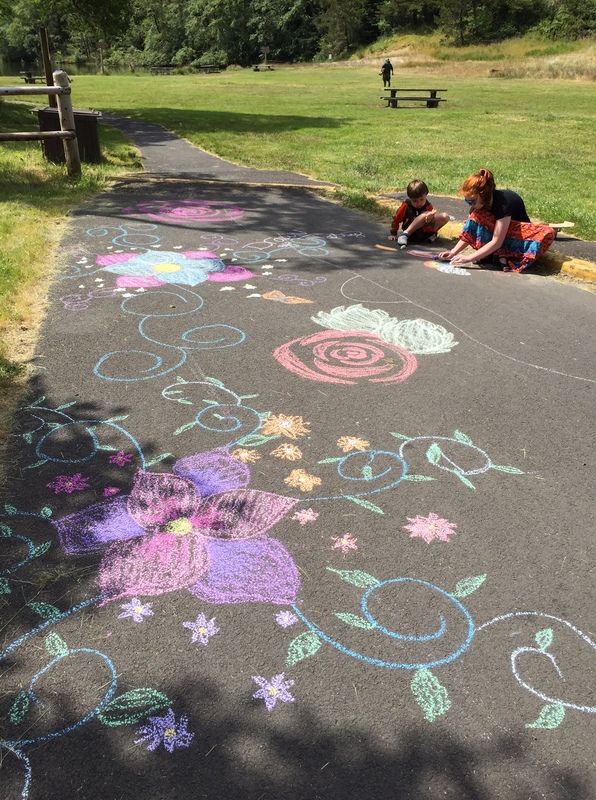 Sidewalk chalk is fun and frugal, and safe parts of parking lots are a wonderful place to create. 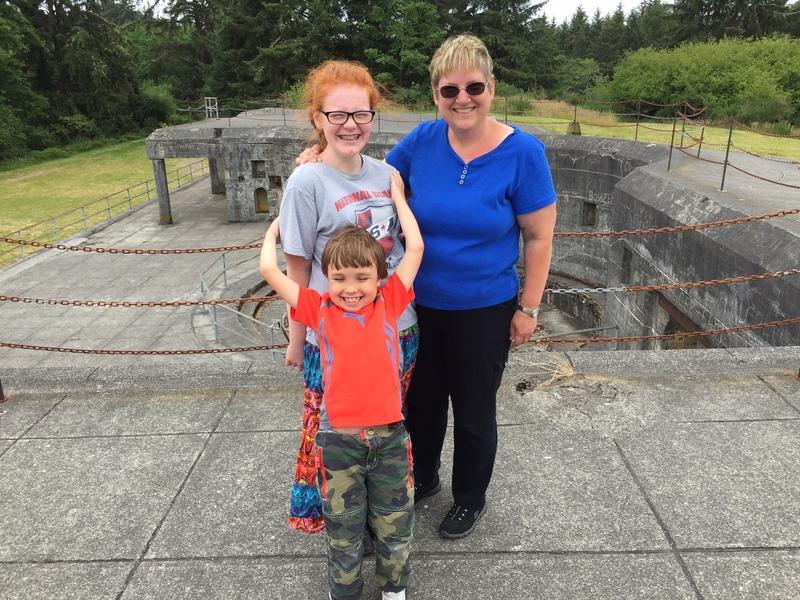 We were at Ft. Steven’s State Park, which is at the upper, left-hand tip of Oregon. There are a lot of things to do there. Camping is an economical way for us to get away. We use our park pass, which we have because we have adopted children from the State of Oregon. We only have to pay the reservation fee ($6) and gas. This campground was farther away than sometimes, but we had hoped to clam. We didn’t get to, but we still had a blast. The clams were suffering from a kind of toxicity, so no one could dig for them at this time. 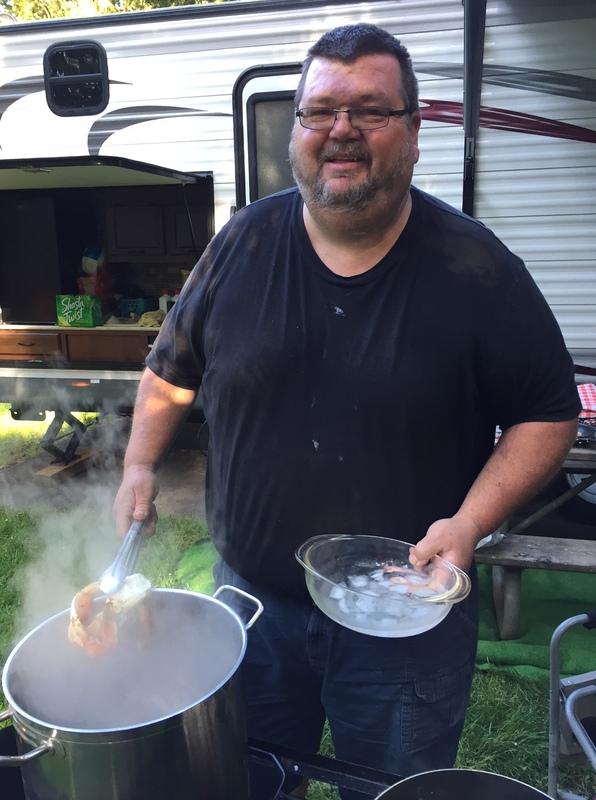 There is always food in the camper–I organized the food last spring, and I had stuffed a bit more into the cupboards a couple of weeks ago because I knew we were going to be so busy right before we went this time. I added some garden produce and frozen items, bought a few items down at the coast, and fed the kids McDonald’s food at times. We never go through a drive-through in the camper, however, so often pack food for the journey, or drive between meal times. Sometimes, we can park near a restaurant, but usually we pack food on travel days. Our fishing and crabbing equipment has been gathered over the years. We were able to buy another crab trap at the rummage sale, so that was nice. 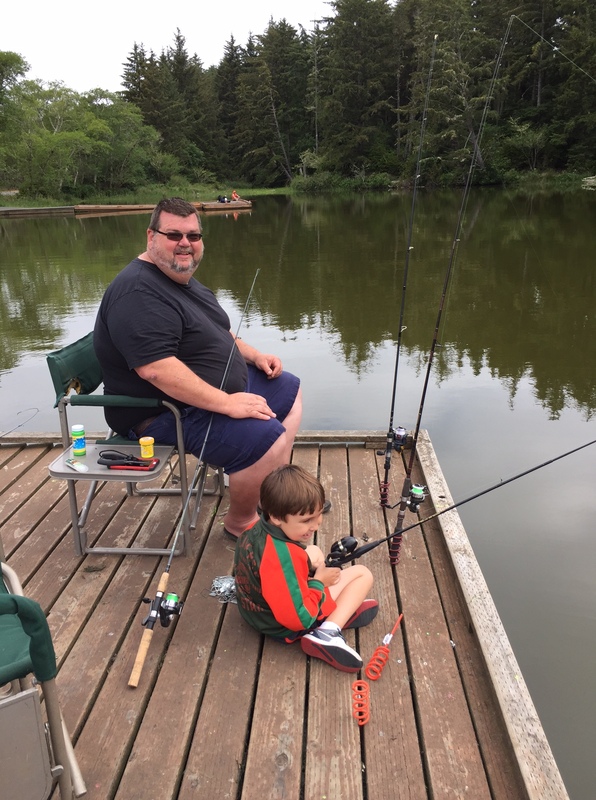 Rob picks up extra fishing poles and reels at yard sales, or on sale at Bi-Mart or wherever (rarely), and usually gets fishing tackle and bait for birthdays and Father’s Day. The only thing we had to buy for fishing this week was 1 carton of worms. We bought some chicken (cheap–88c/lb drumsticks) for crab bait and used the clams from the nice freezer-cleaning man who drove by. Ja’Ana was busy. She stayed with her cousin, Alissa, and both girls were junior counsellors at a day camp all week. Lovana is still working at her job, so she was unavailable. Patsy was the only child for the first half of the week, and then Jake’s daddy brought him down for the second half of the week. 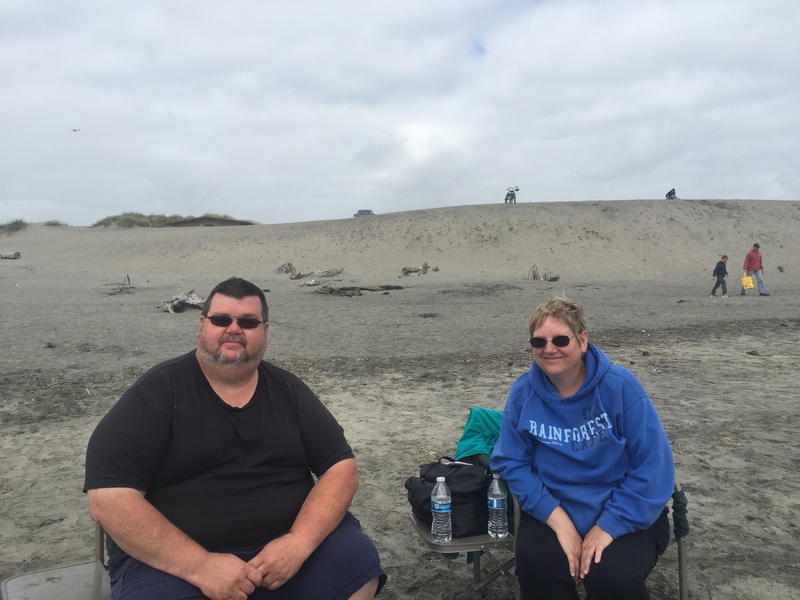 His family doesn’t usually camp or engage in the same outdoor activities we do, and so our goal was to give him some experiences he does not usually get. We succeeded. 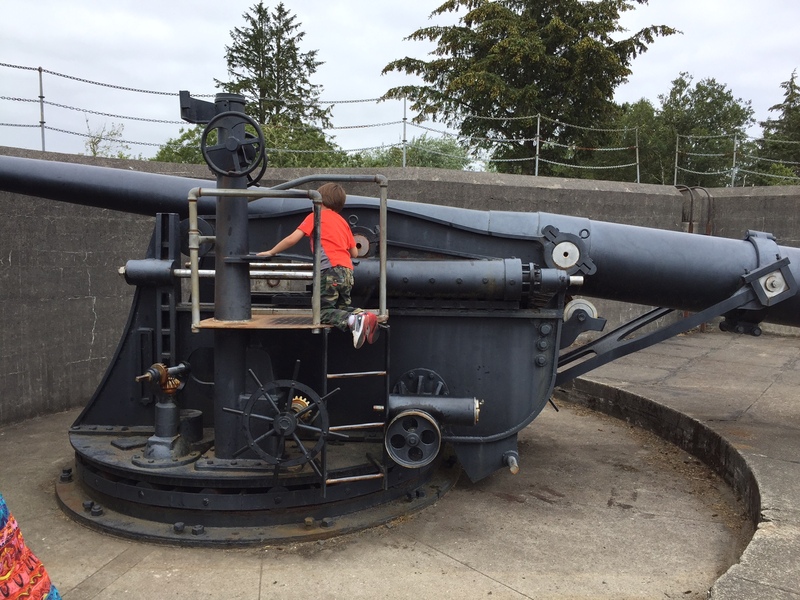 We went to Battery Russell and Ft. Stevens itself, which included a military museum. A lot of the historic area had information about WWII, as that was a time when they were really geared up and ready to go in this area. After the Pearl Harbor attack, there was a real danger that the Japanese would attach the coast, and in fact, there was one time when they did shell a part of the coastline. We did not do any of the Lewis and Clark activities this trip, although the area is loaded with historic sites. The famous explorers spent their winter near that area when they were on their epic trip, so there are many things to see. I’ve been to them before, but they never get boring to me. We cooked over the fire once or twice and used the stove we got at the rummage sale a couple of times. The camper is very adequate for cooking, and it got us away from the mosquitoes. The meals were very simple. We were not in the mood for elaborate cooking projects this trip. 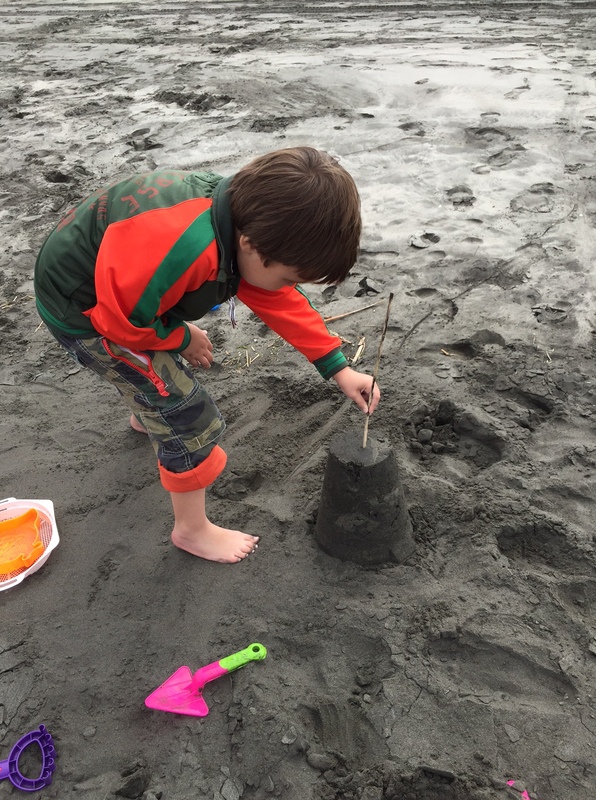 We were able to use the same old sand toys we’ve had for years. I added a few digging tools, bought at the Dollar Tree for a total of…..you guessed it…$1. The historic places were free with the tag that said we were camping at the state park. Rob took the vacuum sealer and froze the 5 (total) fish. We ate the crab. We tried out the propane stove we got at the rummage sale. It works great! We used it for frying potatoes and for cooking the crab. I think we paid around $5 or $10–not sure–we got quite a few items, and the prices have blurred together in my mind. It has been used, but is still in great condition. Rob is going to set it up in the outdoor room/enclosed porch at our house and I’m going to can on it, since there is only a flat-topped stove at this house and that is not recommended for canning on. During the evenings, we watched C.D.’s., the kids built Legos, and read books. We listened to Audio Books on the drives. A lot of the materials were from the library. Both kids are working toward summer reading prizes. The kids scattered old pancakes for the seagulls. We drove out to a place where we could see the boats going in and out of the mouth of the Columbia River. It was very interesting. We drove across the bridge between Astoria and Washington state. It is about 4 miles long and very fun to go across. 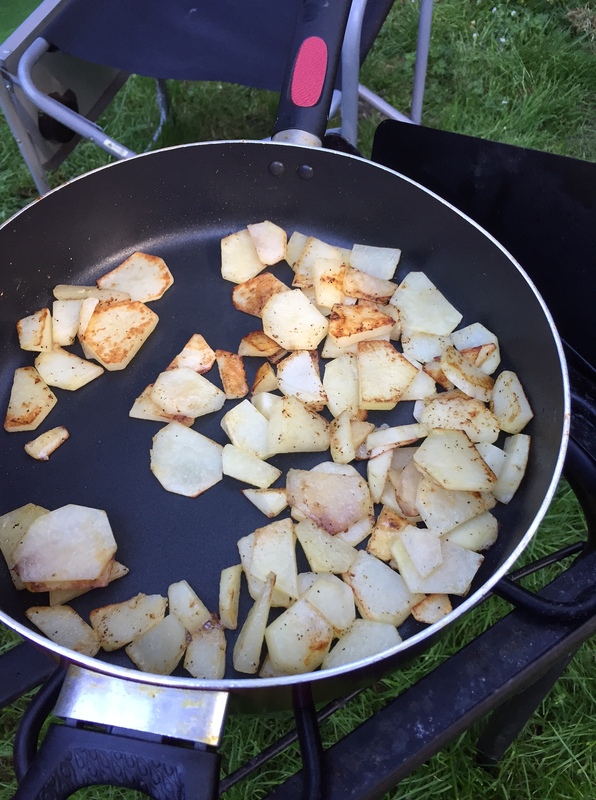 I cleaned the outdoor kitchen and did my usual cleaning in the camper at the end of the trip. I prefer to clean it while it is hooked up to water and sewer, not when I get home. On Friday morning, we packed it up very early and came home. Jake was going on vacation with his family, so needed to be back and I had quite a bit to do Friday afternoon. Rob needed to go up to the camp and get Ja’Ana that evening. On Saturday, we did a little shopping at Grocery Outlet, I cleaned in the house, worked on laundry and worked in the garden. I weeded and picked things. I harvested my first zucchini and my first 2 cherry tomatoes. They are the Sungold variety and I love them! I also got lots of lettuce and already ate a salad from it. I got quite a few raspberries and about a cup of blueberries and a little broccoli. I harvested quite a few snow peas–a big bag. I also cut some cilantro. Rob picked a few cherries at my sister’s farm when he went up there on an errand. My brother-in-law, Jake’s dad, texted us that he had accidentally forgotten his fruit for their trip on the counter, and asked us to go get it and eat it. So, now we have some little oranges, a few apples, and some bananas that Rob immediately froze for smoothies. We are definitely going to get our fruits and veggies this week! I love this time of year with the garden starting to produce, and fruits growing ripe one by one. Yum! It was a week full of simple pleasures, lots of rest, and many fun experiences. It’s always fun to share something you love with someone you love. Jake got lots of new experiences and had a ball, as did the rest of us. And, like always, it did not cost us an arm and a leg. What a lovely week!! I want a little camper but my hubby isn’t very interested. So I enjoy reading about others who do! We even went camping on our honeymoon. How did you cook the crabs? Rob fired up the propane stove outside, and put about 3 gallons of water and about 3/4 cup rock salt in it and brought it to a rolling boil. He cleaned the crab before cooking this time, by removing the insides and breaking the crabs in half. He then dropped them into the boiling water and cooked for 10 minutes at a full rolling boil. When the time was up, he removed them with tongs and put into ice water. The little bowl pictured was not nearly big enough, so I washed out a bucket and put more water in it, with the ice. Normally, he just drops the live crabs into the boiling water, whole, and cleans them after he cooks them. 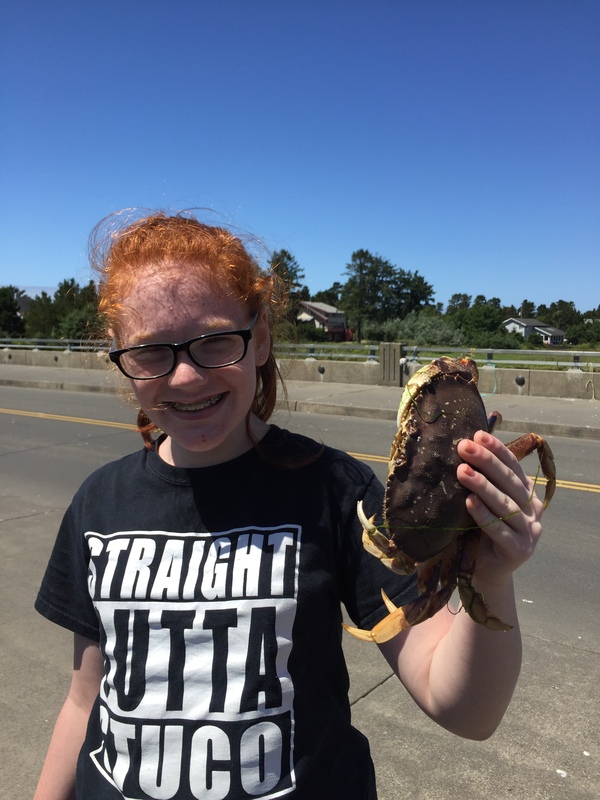 However, because the razor clams in the area had some toxicity, it was recommended that crabs be cleaned before cooking and that the insides and cooking water not be consumed to ensure their safety–although every source declared that they were safe and fine to eat. Then, he sat at the picnic table and cracked them out, and the crab meat was put into a ziplock baggie in the fridge and eaten over the next few days. This looks like a wonderful trip. Being by the water is so relaxing. I really enjoy reading about all the activities you do with your kids. Thank you. I love kids and love doing fun things with them. I’m fortunate that my job right now is getting to plan lots of super fun, enriching activities for kids, as well as doing it just for fun! I always enjoyed that part of homeschooling. I can read your excitement in your post, what a fun trip. I’m assuming the weather wasn’t terribly hot either. We helped with a church rummage sale where we were outside, cleaning up in the almost 100 degree heat. 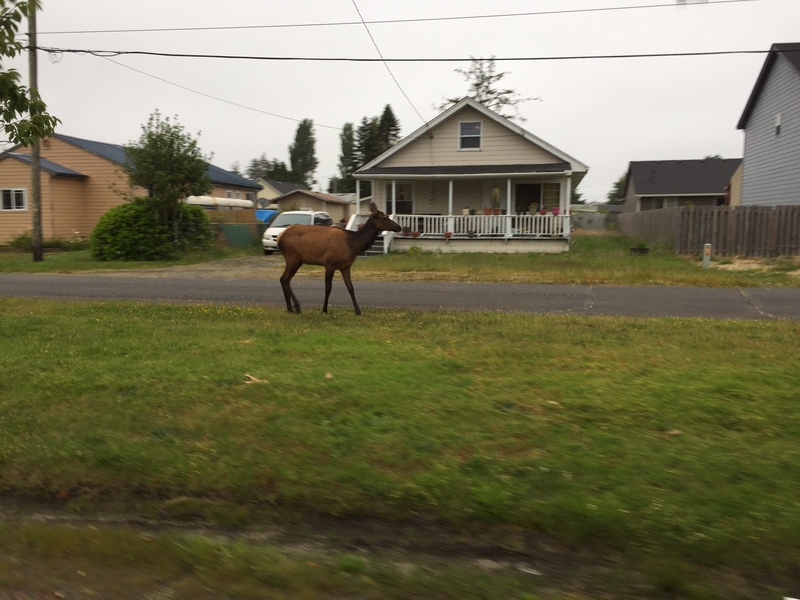 The next day, when we drove over to the coast, it was cloudy and cool, and the week alternated between sun and clouds, and one morning we got misted on for a little while. It gave our heat rashes (seriously!) time to calm down:) How refreshing! And, it was still warm enough for all the activities we did. Now, back at home, it has been very pleasant. The 90’s and 100’s are somewhat rare where we live, so we are not used to them. Isn’t it amazing how much fun a bit of sidewalk chalk can be? My whole family will go out and draw under the guise of “playing with” my grandson. It was so nice to have such a large “canvas” for Patsy to draw on. She is way more artistic than I am, and really enjoys it. What a fun time. 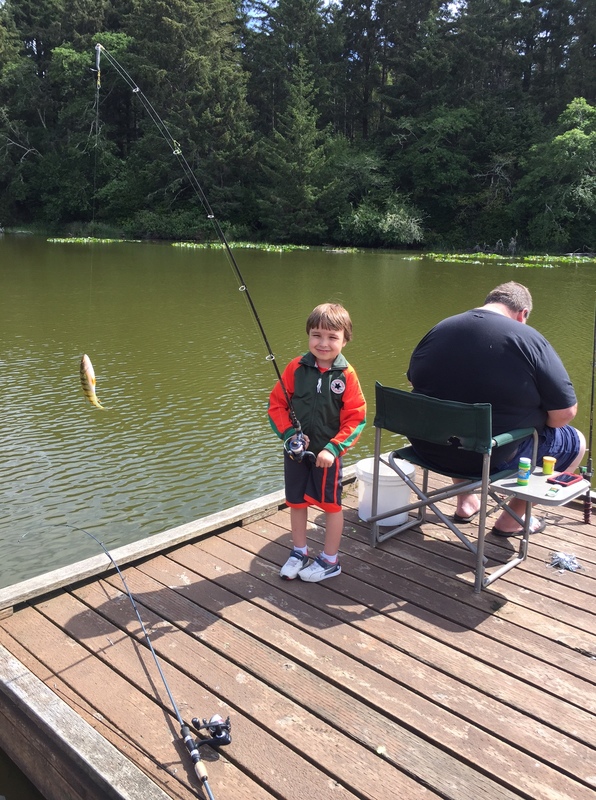 Loved seeing that fish that Jake caught – I bet these will be great memories for him and Patsy as well. Your story about your trailer makes me miss mine. I’d love to get another one but don’t have a free place to store it. I loved being able to just hook up and go. I was like you – I’d clean it at the end of the trip. When we got home, I’d take all the washables, do the laundry and then put them back in the trailer. Cheers. That’s exactly what I do–get it cleaned and ready, and all towels, etc. washed. Then, it’s just food, clothes and put the sheets on if I haven’t done it yet–and we’re off pretty quickly. I have to say, you are brave. After all these years, Rob still hooks up and drives. I do the inside things and he does the outside. So old-fashioned, but it works well for us to each have our jobs. But, we have talked about me learning how to do some of these things. One time, Rob got a terrible tooth infection while we were camping 5 hours away and almost could not drive home. He finally stopped his pain meds and drove home, but it was pretty brutal on him. So, I may need to do these things some day. My trailer was called a Scamp, made in MN, and it was only 13 ft from hitch to bumper – not a 13ft body. It was the best ‘trainer”. We’d drop the curtains in the front and back window and the trailer was so small you could see through and not have to rely on the mirrors. I learned how to use the mirrors in time but not in the beginning. And once when we got stuck in a campground, some neighbor guys joined in and literally helped pickup the trailer with my hubs and swing it around and then we rehitched it. Like I said, perfect beginning trailer. That’s great! I could probably handle that:) I hope you are able to get another one, if you decide that’s what you want, in time. Your trip looks and sounds like so much fun! I’m glad that you are all able to get away in your camper and have that wonderful free pass to help cut the costs. It was! We just love camping. it never gets old for us. And, yes, the pass is a real life-saver. It actually enables us to go so much more often than if we had to pay. We did a lot of tent camping in Arkansas when I was married. There were a few wonderfully clear streams but we didn’t make it to a real lake or river. Glad Jake got to enjoy this. I was a city girl and had never been camping before I got married. Good times for kids to be free and enjoy nature. I love camping by a mountain stream, as well. When we were younger, and more spry, we used to go backpacking up into the mountains, and I remember those experiences so well. The mountain streams were so beautiful.